Southern Comfort Entertainment — Mobers.ORG — Your Daily Source For Mobile FUN! Southern Comfort Entertainment, "A world of entertainment, let us be the sound track to your life. Since officially launching onto the Google Play store, the Southern Comfort Entertainment application has been well received by consumers. The application offers music lovers with the chance to stay completely up-to-date with the Southern Comfort Entertainment record label. Once downloaded, users will be able to stay up-to-date with the latest music releases, discover new music genres and artists and even share their own musical experiences. The application aims to help users become social and join a music environment with ease. Since the majority of consumers now own a smartphone with internet access, the Southern Comfort Entertainment gives everybody the chance to become a part of one of the fastest growing record labels in the world. 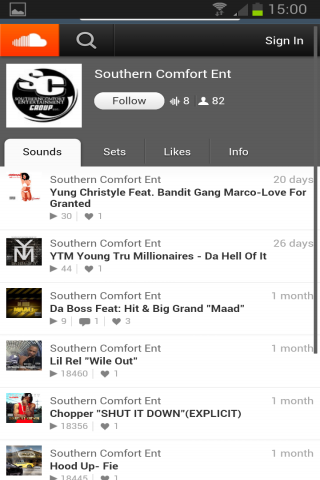 Within the app, there is easily clickable links to head over to the Southern Comfort Entertainment soundcloud, as well as their official website. 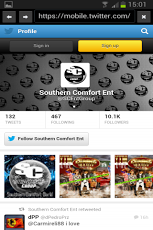 In short, the application serves as a central hub for those who support the Southern Comfort Entertainment label. A world of entertainment,let us be the soundtrack to your life! GET IT NOW - IT'S FREE ! !